- "Fighting Back in the Health Service." 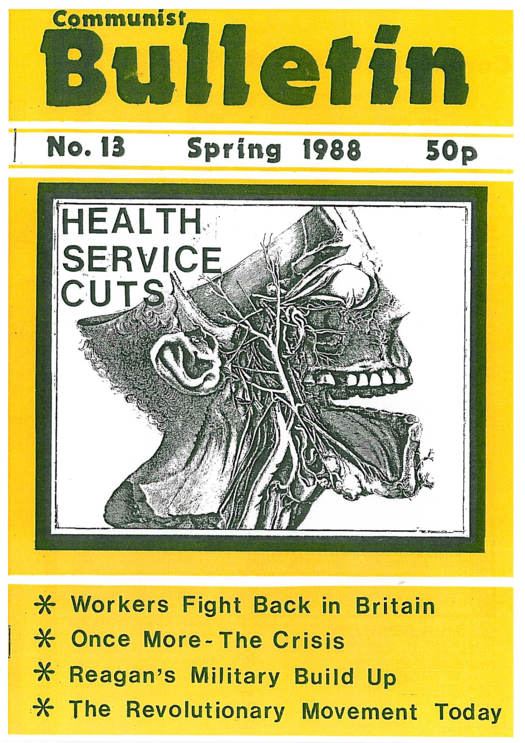 Workers in the Health Service in Britain have been fighting back this Spring in defence of their jobs, wages and conditions. MISSING FROM PDF. - "The Re-Emergence of Class Struggle." This Spring has seen workers from the Health Service, Fords, Vauxhall, Landrover and the ferries in a wave of strikes against capitalism's austerity plans for the working class. MISSING FROM PDF. - "Leaflets." CBG Leaflet handed out at NHS rally in Scotland. Wildcat leaflets handed out in England. MISSING FROM PDF. - "Once More the Crisis." The 'Crash' last October heralded the return of the crisis of Capitalism, a crisis now deeper than ever before. - "Confrontation and Crisis: The Reagan Years." The Eighties have seen the greatest military build-up by the Reagan administration, now being radically dismantled as the effects of the 'Crash of 87' are felt in the U.S. economy. MISSING FROM PDF. - "It Was Twenty Years Ago Today." Twenty years on from 1968 the Revolutionary movement faces a crisis. This preliminary text outlines the problems we face, their origins and the necessity for us to surmount them if we are able to play the crucial role revolutionary minorities have in the Communist project. - "Obituary for Wildcat?" The Wildcat group has finally fallen apart amidst political acrimony. We present to a wider audience, their final testament. - "Ripples in the Pond." The E.F.I.C.C. has recently published a text attempting to come to terms with precisely the problems that the CBG has been trying to convince the milieu to grapple with since its inception. - "Letter from the Communist Workers Organisation."